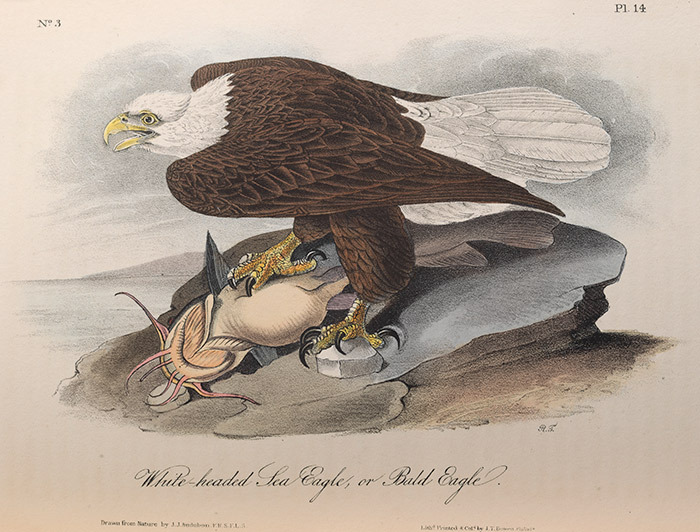 It was a chance encounter with nature artist Alexander Wilson that made John James Audubon realize he could make a living from selling his drawings featuring birds of America. At the time of the meeting, Wilson was also trying to create an ornithological collection, but upon seeing his work, Audubon knew that his own vision was the superior one – an observation that would work against him later when he wanted to publish the work in America. First octavo edition, containing 500 hand-colored plates. 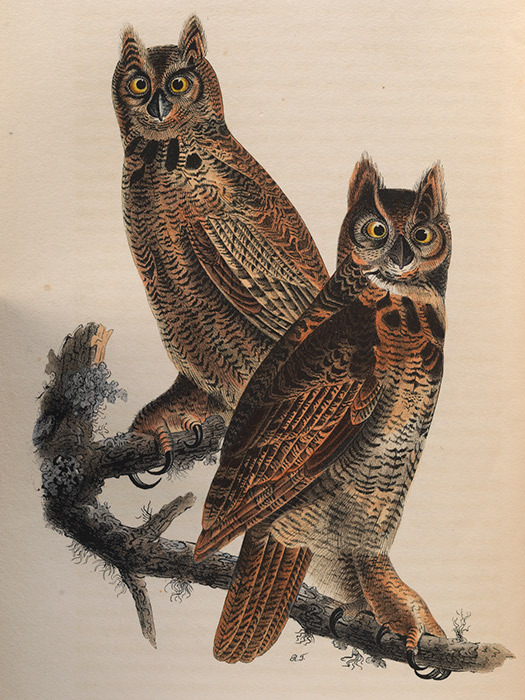 In 1824, three years after Audubon began Birds of America in earnest, he was ready to publish. When he arrived however at the Academy of Natural Sciences in Philadelphia, armed with his portfolio, he made the mistake of boasting that he had seen Wilson’s work and that it was inferior to his own. This irked Wilson’s influential friends including ornithologist George Ord, and Audubon’s work was dismissed. With no one in America willing to publish the work, Audubon set sail for England to seek funding, unaware of the reception he might receive. Within ten days of his arrival, the Royal Institution put on an exhibition of Audubon’s paintings, and over the next two months he toured Europe showing his work in Edinburgh, London and Paris travelling as the American Woodsman and regaling his audiences with tales of the Wild Western Frontier. 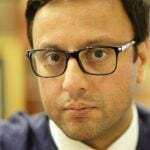 This effort was quite successful and secured subscribers to the work in high numbers. 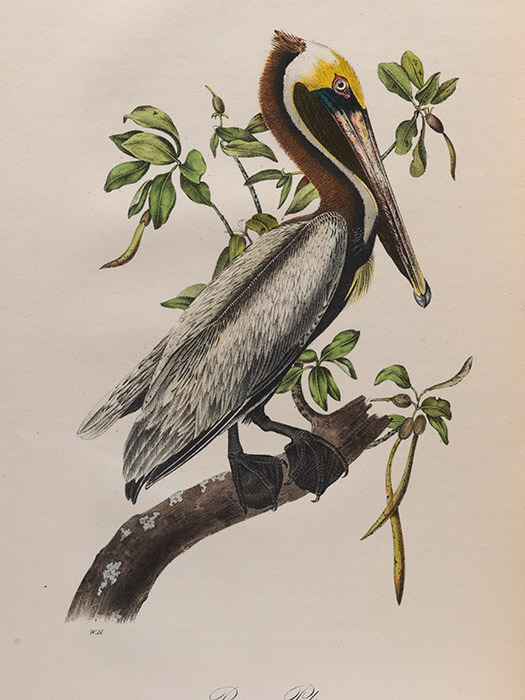 This enabled Audubon to move forward with producing the book. He immediately created 10 plates with a craftsman in Scotland, but this relationship was short-lived. Upon returning to London, Audubon began work with Robert Havell Jr. who at the time was considered to be the best engraver in the world. Over the next 13 years the work was created. It was a laborious process with artists filling in one color at a time by hand. By 1838, however, 435 plates in 87 sets of five had been issued. Among the subscribers were the King and Queen of England and the King of France. 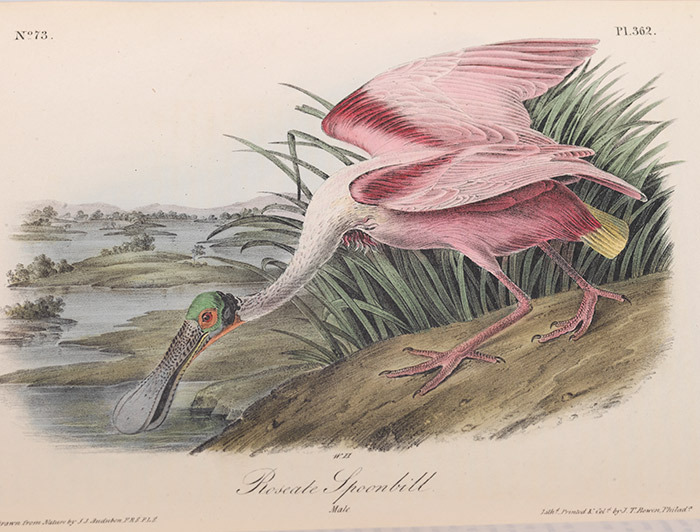 Now famous at the age of 41, Audubon returned to the US and in 1831, he began work on his ornithological biography, five volumes that combined his observations of birds. He included accounts of his wildlife adventures, some of which were tall tales. It sold well. On the back of this success, he set off again and spent another 13 years recording even more species. 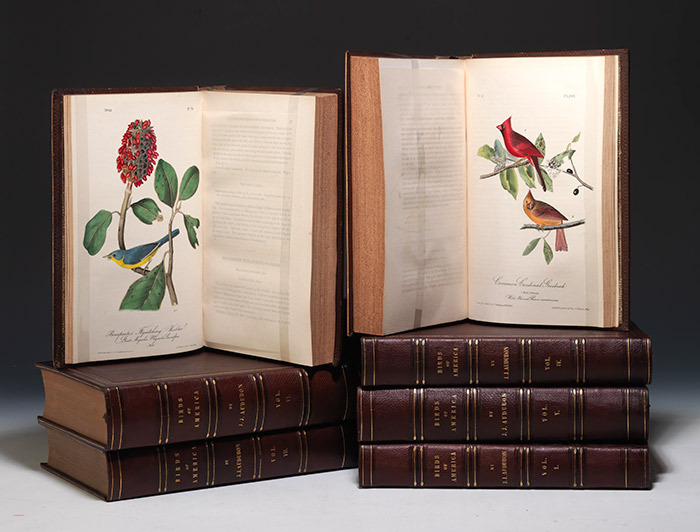 On June 20th in 1838, the fourth and final volume of Birds of America was finally finished. It featured 435 images and documented 497 species including six now-extinct birds – the Carolina Parakeet, Passenger Pigeon, Labrador Duck, Great Auk, Esquimaux Curlew, and Pinnated Grouse. 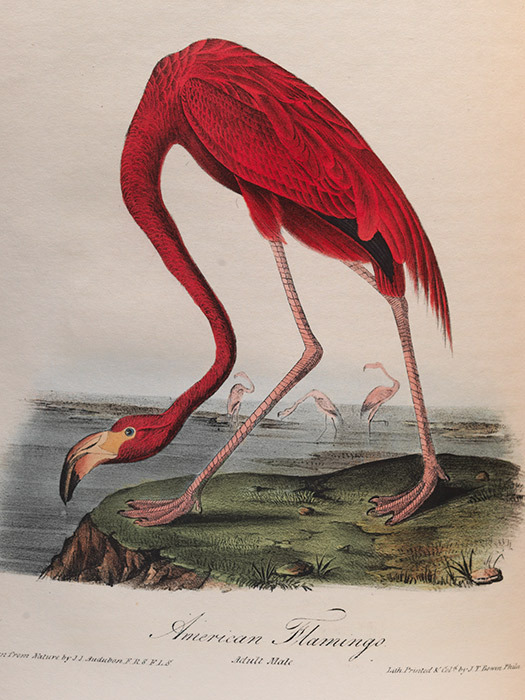 Audubon did not make much money from the elephant folio edition and in 1840 began to reduce his images to prepare for the release of the smaller octavo edition. When this edition was completed, he sold 1200 copies, which rescued him from financial ruin. This edition became one of the most successful subscription books of the 19th century. For those wishing to look at each of the plates featured in the double elephant folio edition visit the University of Pittsburgh’s website, the university owns an edition and has made this content available online. Click here to visit the site.